Well, there's the entire CM:Afghanistan title. Its got pre-Taliban mujahideen fighters. I suppose in theory one could swap out CMSF1 'fighter' models with 'Afghan' models. I don't think anyone's ever tried, though. CMSF2 is even more problematic because the figure poses and movements are based around a different, updated skeleton structure. Re the Mujahideen mod have you tried renaming it as the naming conventions may be different in the two games(?). Edit: yes, it works beautifully. Great mod. Thank you, dragonwynn! BTW: I looked at my CMA Z folder and I see a "mujatribal_ALL_ragtag_camo" mod. And yes, I see the xnt Heart of Darkness Taliban mod in my CMSF Z folder as well. This mod only works in CMSF 1 right? It only works in SF. There is no way that I know of that it can be manipulated to work in SF2. The mds files have completely different naming conventions in the code for SF2. I got this. I suppose it is the same mod mentioned in the thread. It also includes portraits and even arabic sound files. There was also an ANA mod that used dutch infantry. 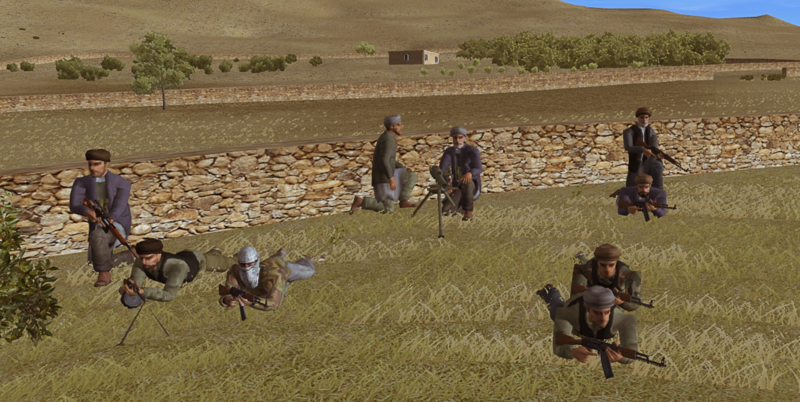 There is a scenario called ":Sangin Valley Mods" it has Taliban and other mod with it. Is that what most players are talking about? If you want it I can post it here. If it will give us Taliban in CM:SF2.....Bring it on! Here you go. See if this will work. I haven't checked it yet with CMSF2. Will tonight. I haven't checked it yet with CMSF2. Will tonight. It will not work (as posted above). I wrote a semi detailed explanation in the Civil War thread. SF1 and CM:A are the last bastions of model swapping.